Like the rest of our bodies, our eyes start to lose flexibility and strength as we age. When this happens to the lens of the eye and its surrounding muscles, your lens becomes stiff. This makes it harder to see objects that are close to you clearly because your eyes aren’t able focus properly. It’s an almost inevitable part of aging that typically begins around age 40. 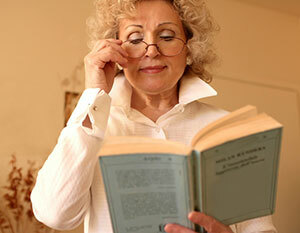 Presbyopia can be easily corrected with either eyeglasses or contact lenses from an optometry clinic. No. Farsightedness is a result of distortions in the shape of the eyeball. Presbyopia is caused by increasing stiffness in the lens. Most commonly, progressive lenses or bifocals are recommended. The top portion of the eyeglass lenses will correct your vision at greater distances, and the bottom portion will assist you to see clearly up close. While bifocals have a distinct edge between the two prescriptions, progressive lenses transition gradually between the areas. Over time, if your presbyopia continues to change your vision, your prescription will need to be updated periodically to maintain clear vision. If you are open to a more permanent treatment, ask your eye care provider if you’re a good candidate for conductive keratoplasty. In this procedure, precise radio waves are used to reshape your cornea and improve your ability to see nearby items. As a part of natural aging, presbyopia can be annoying, but luckily, it’s easy to address. Whether your preference is for glasses, contact lenses or surgery, talk with your eye care provider to find out which options are best for you.